Fifty inches of rain. Nine trillion gallons of water. The Gulf Coast of Texas, and especially the Houston metropolitan area, has been inundated by rain produced by Hurricane Harvey. And as of this writing, the rain continues along a broad swath of the Gulf Coast, with a flood threat extending all the way east through New Orleans to the Florida Panhandle. Even for one of the wettest and most flood-prone parts of the United States, the rainfall totals and flooding are breaking records. So, what has made Harvey such a prodigious rain producer? The amount of rain that falls at a given location can be boiled down to a surprisingly simple equation: The total precipitation equals the average rainfall rate, multiplied by the rainfall duration. In other words, the most rain falls where it rains the hardest for the longest. Tropical cyclones in general are very efficient rain producers, because they draw large quantities of water vapor into the atmosphere from a warm ocean. That moist air rises and the water vapor condenses, and a large fraction of that water falls as rain. Tropical cyclones can also last a long time; if their motion slows, then a particular region can experience that heavy rainfall for multiple days. Even compared to other tropical cyclones, the rain from Harvey has been very hard, and gone for a very long time. 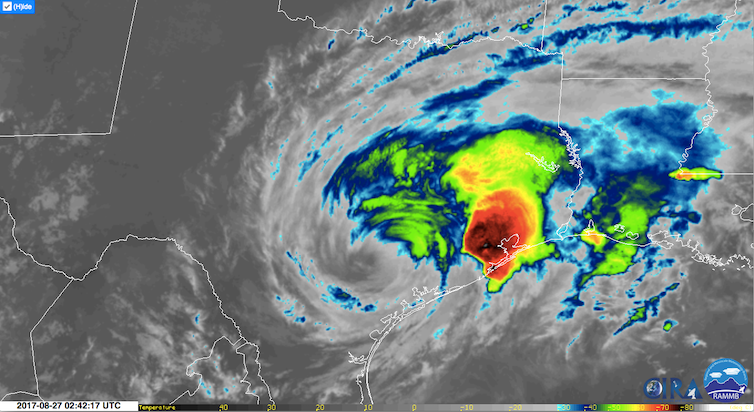 On Saturday evening (August 26) into Sunday morning (August 27), an intense band of storms developed to the east of Harvey’s center, and lined itself up right over Houston. This is a process known as “echo training,” in which it appears that the individual thunderstorm cells are like train cars that repeatedly pass over the same spot and bring with them heavy precipitation. 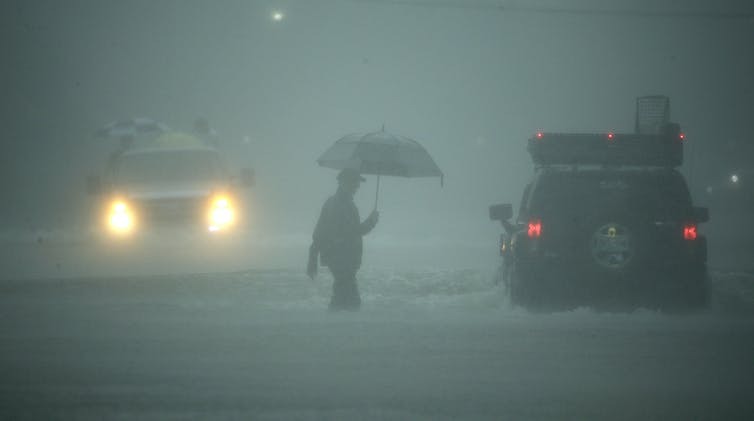 This precipitation band was producing up to six inches of rain per hour – an extremely high rate – and it remained over the Houston metro area for several hours, with a couple more that followed immediately after. One location just southeast of downtown Houston recorded 13.84 inches in just three hours. 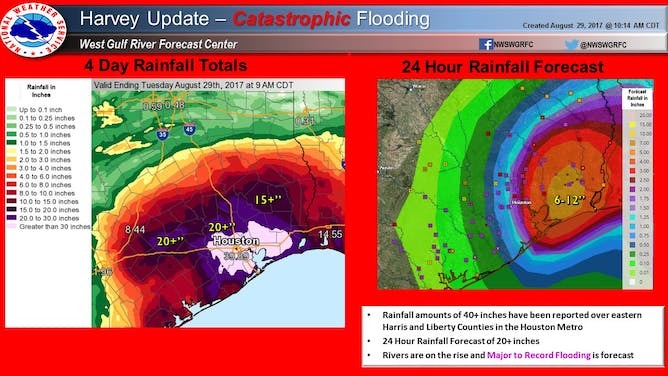 These rains from Saturday night into Sunday morning initiated the massive flooding in the Houston metro area. Animation from the Houston, Texas National Weather Service radar on Saturday evening, August 26, 2017. The left panel shows radar reflectivity, which is related to rainfall intensity. The right panel shows radial velocity (green colors toward the radar, red colors away). The green polygons show flash flood warnings issued by the NWS, including a rare ‘flash flood emergency’ for Houston. Then, after this initial intense burst, there has been no respite. Usually, when a tropical cyclone turns poleward from the tropics toward the United States, it will interact with one or more midlatitude weather systems that will send the storm on its way after a day or two. But this August, the jet stream has been positioned well to the north of Texas, so none of these disturbances has approached, and Harvey’s center of circulation has barely moved since it made landfall. As a result, across the Texas (and now Louisiana) coast, there have been periods with intense rainfall (in more of the rainbands described above), along with lighter, but still substantial, accumulations. This combination of unusually high rain rates and long duration has resulted in a very large area with 30 to 45 inches of rain in a few days. 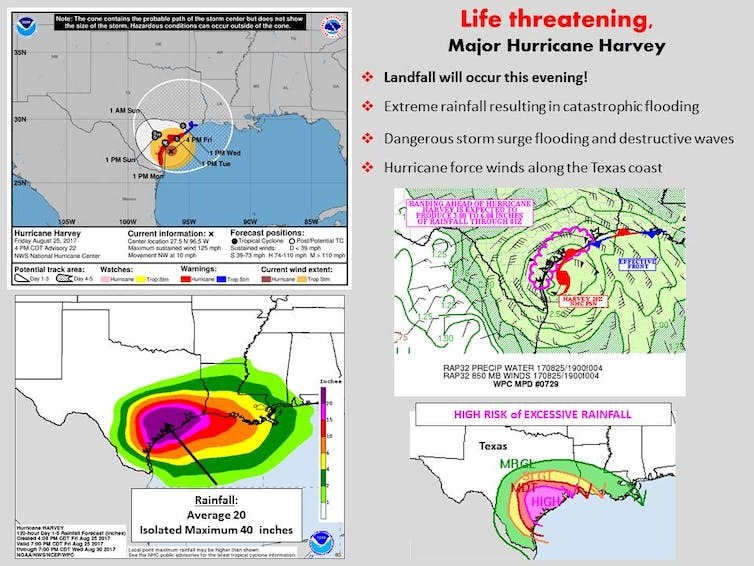 Those of us who study extreme rainfall and flooding, and those who live in and around Houston, know this area is vulnerable to both very heavy rainfall and destructive and deadly floods. The previous standard-bearer for extreme rainfall in the region was Tropical Storm Allison in June 2001, which produced just over 40" of rain around Houston. But the excessive accumulations were fairly localized. Major floods again occurred on Memorial Day in 2015, and on April 18-19, 2016. In the April 2016 event, an intense line of overnight storms produced up to 15" of rain in a few hours, similar to the “training” rainbands in Harvey. But with Harvey, the area covered by the heavy rainfall has been vastly larger, and the rain has persisted for days. For comparison, in just one day (ending Sunday morning, August 27, 2017) the area covered by rainfall from Harvey exceeding 16" is several times larger than the entire April 2016 flood event, and at least two more days of similar accumulations have followed. To make matters even worse, there were also numerous tornadoes reported as the rainbands came on shore. It’s fairly common to have tornadoes occur in association with landfalling hurricanes, but what struck me in this case was that tornado warnings were being issued in the same places that had just received massive amounts of rain. My research group has studied the challenges associated with multi-hazard situations, and specifically when the threats of tornadoes and flash flooding occur in the same place at the same time, as the protective responses to those hazards can be at odds with each other. For people to be under both a tornado and a flash-flood warning at the same time is surprisingly common – these overlapping warnings occur around 400 times per year on average. But this situation was taken to a new extreme during Harvey, when tornado warnings were being issued at the same time that emergency officials were sending messages for people to go to their roofs for safety (rather than risk getting caught in the attic). The heartbreaking (but also heroic) video footage of water rescues speaks to the immense human impact of this multifaceted storm. One final remarkable aspect of Hurricane Harvey’s rainfall is how accurate numerical weather prediction models – and the human forecasters who use them to make official forecasts – were at highlighting the incredible precipitation accumulations. Medium-range forecast models at least a week in advance were showing Harvey stalling out along the Texas coast and producing extreme rainfall. As the event neared, essentially every numerical model was showing accumulations over 25 inches. Often, when meteorologists see models making predictions of events that would be unprecedented, we are rather skeptical of that guidance, because there are no points of reference to compare to. But in this case, the models were in close agreement about the potential for a truly major event, and forecasters saw the gravity of the situation. Forecast graphic from the NOAA Weather Prediction Center. Tweeted at 5:47 p.m. CDT Friday, August 25, 2017. One of the fascinating aspects of studying extreme rainfall and flash floods is the wide variety of storm systems that can produce heavy rain, and trying to figure out how the ingredients came together in each of those diverse situations to inform and improve future forecasting. For Hurricane Harvey, researchers and forecasters will be analyzing the ingredients that led to this record-setting flood for many years to come.